That’s right, boys and girls! Its that time…again? 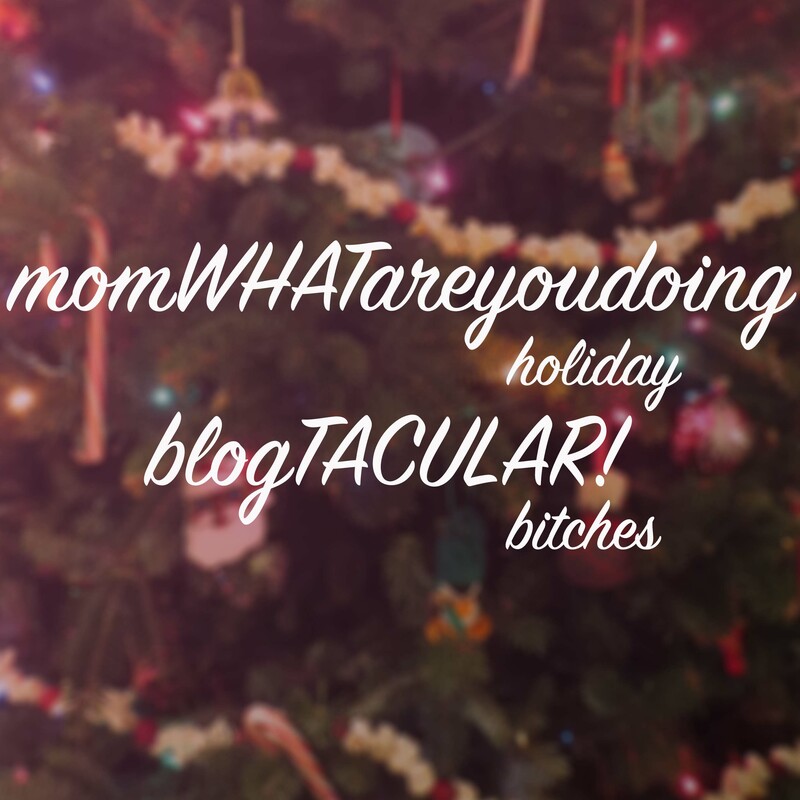 No, not again, for this is the first annual momWHATareyoudoing Christmas Blogtacular PART 1. You’re in for a treat, my friends; we have a special guest appearance by the whitest kids ever on the Lawrence Welk show. And at just 42 seconds in, Randy cries. Don’t worry, he keeps crying. Stupid Randy. Watch as Santa awkwardly addresses each of the white kids by their equally awkward white names! Now that you’re primed for holiday fun, I’ve decided to give you all a little glimpse into Santa’s workshop. Not up at the North Pole, but better than that. We have my mom, who is basically a Christmas elf. As previously mentioned, my mom loves Christmas. Not like a lunatic, but like an enthusiastic kindergarten teacher who is doing bath salts for the first time. Anyway, she decorates the house with a MILLION Christmas vignettes, and, because its Christmas, and Christmas is about sharing, caring, and staring, I have decided to share them with you good folks. 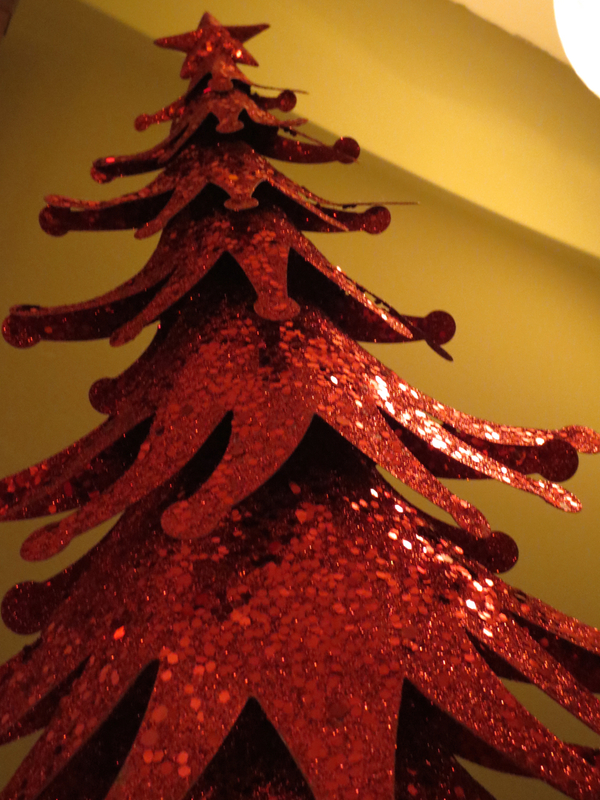 There is décor large and small, mixed in with a heaping portion of glitter and sparkly things. Let’s get started, shall we? First up: The classic Christmas village. Whose credenza is complete without a few antiquated looking McMansions and some faux snow? Let us also note the lady ice skating on a mirror! Some people go nuts with the Christmas village thing, like they’re creating their own little world so they can dream of escaping one day from their own McMansion to another McMansion in Vermont or, much more likely, Fernadina Beach, Florida. My mom, however, seems to get the idea. 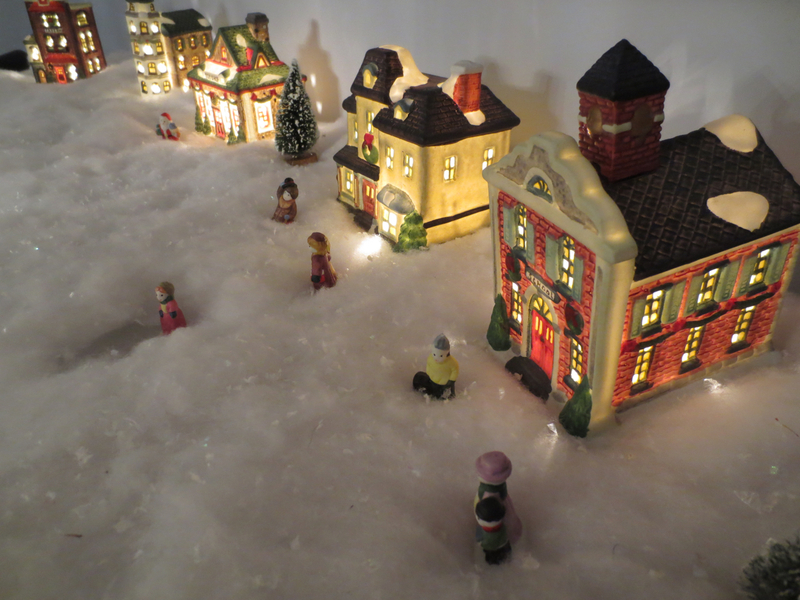 Its a Christmas VILLAGE, not a Christmas megalopolis. Once you go over 5 structures, you’re starting a Christmas metro area and then you’ve gotta worry about infastrucutre. There’s already enough liberals on that government-subsidized mass transit anyway. We don’t need any more. Better to create a self-sufficient Christmas village of decent people. Is Santa robbing that toy store in the back? Oh, no, he’s shopping. Cute. I can’t not put this picture in the mix. 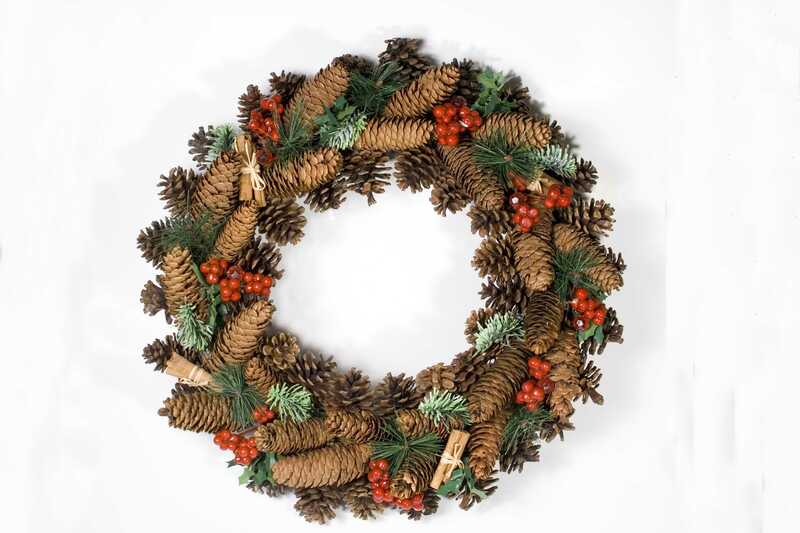 The mantle: measure of Christmas spirit since 1906, when Southern Living starting shaming women everywhere into making their place look so hospitable that angels would shed a tear upon seeing its splendor. Who am I kidding—it was definitely earlier than that. When did the Sears catalog start? Whatever. I think mom did a great job here without making the wreath a friggin train wreck full of poopcones. Don’t know what the hell the Christmas cones are but they work. NEXT! Now here’s an interesting piece. This lovely lil’ fella made its debut last Christmas. It’s old as farts. It’s actually made by Hallmark (I KNOW. first/last good thing they’ve ever made. Except for “Precious Moments” amirite?) Its all made of cardstock and folds up into a little, old, decrepit, and well-loved folder. 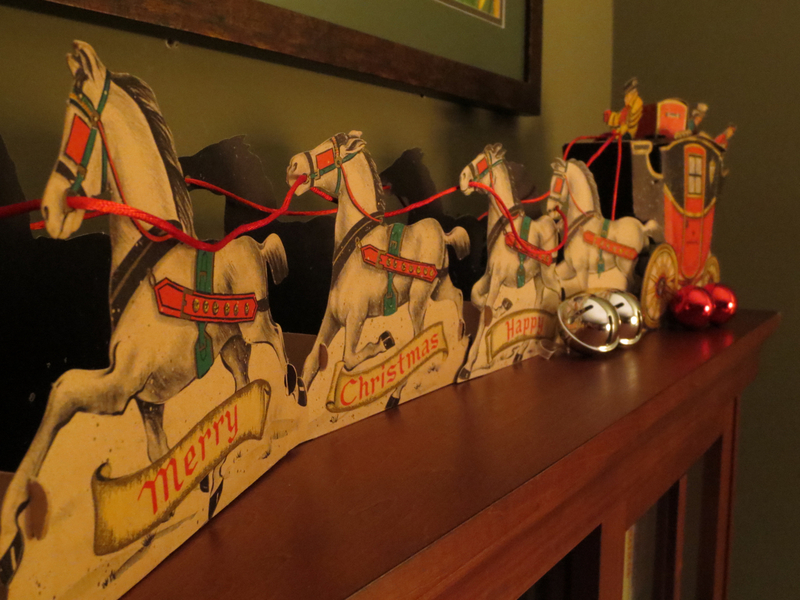 This horse and carriage combo is sitting on top of the DVDs/VHS tapes, reminding us all that Christmas isn’t Christmas without a little horseshit and some good movies. I had to take four or five different sparkly elements off this shelf so you could see the whole carriage. 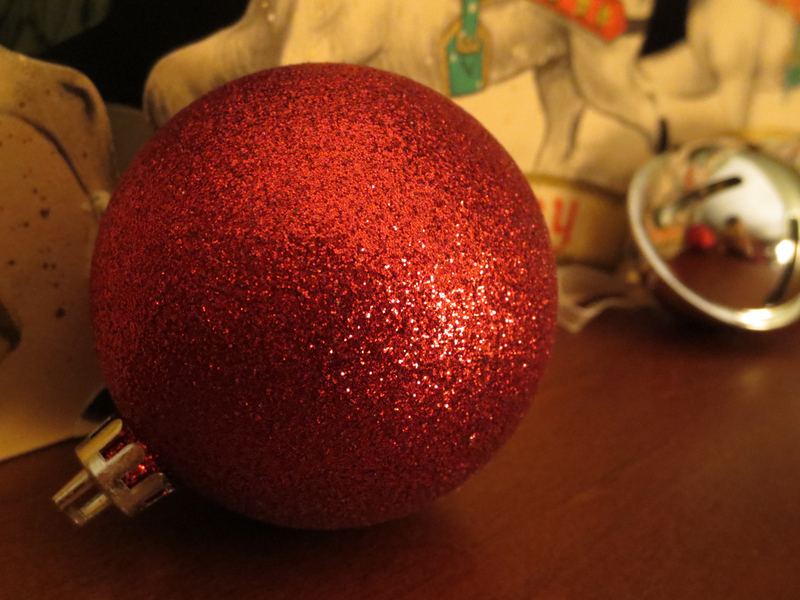 Case in point: Sparkly ball. Don’t touch it or you’ll have glitter on your fingertips until President’s Day. This is the kind of book display that librarians KILL FOR. I’ve seen it. 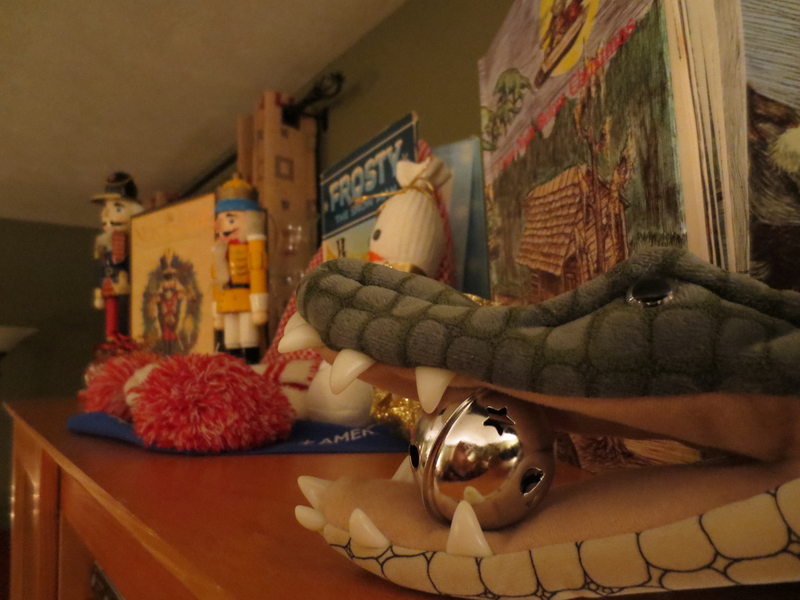 Here we have The Nutcracker with genuine no-nut-cracking nutcrackers, Frosty The Snowman with an antiquated scarf and a stuffed sock made to resemble a snow person put through a sausage maker, and The Cajun Night Before Christmas with an alligator puppet who is clearly hungry for some Christmas Spirit. Not gonna lie, I have been a consultant on this piece I the past. Sometimes my dad pops down the Alligator and uses it as a puppet to read the story to children. Now THAT’S the Christmas sprit. aaaaah, The annual Christmas Cart! A fine tradition. What, you don’t have a Christmas Cart? 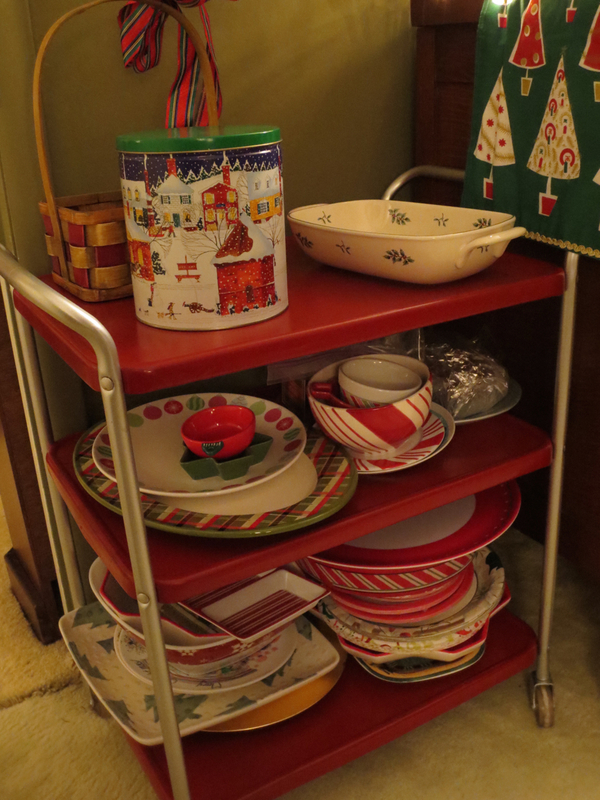 The Christmas Cart is a fairly recent add-on to my mother’s repertoire. It’s a utility cart spray painted for Christmasy magic in silver and red. This utility cart is EXCLUSIVELY for Christmas and even more EXCLUSIVELY for Christmas trays, plates, or other decorations to be staged there for their eventual disbursement throughout the house. 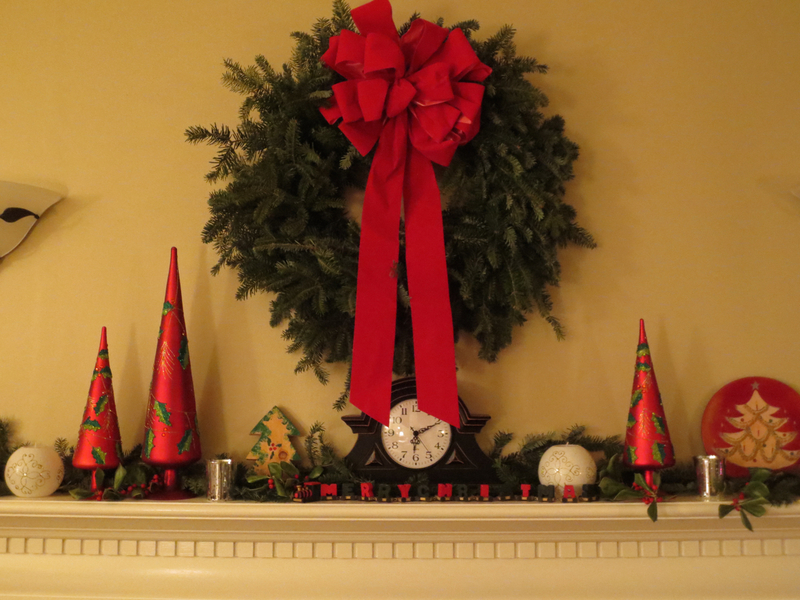 My mom basically puts a Christmas something on every flat surface, and even some not-so flat. Rather than use any of the multitude of flat surfaces already available for staging things like Christmas trays, my mother has opted for Xtra Xmas storage via the cart. I count at least 22 different trays in this one picture. Nailed it. Also there’s an unused Christmas tin on top for future cookie stuffing. It doesn’t have cookies in it now. Remember, the Christmas cart is for staging the attack. We’ll get to the rest of the tins later. I seriously forget every year what this thing is called. 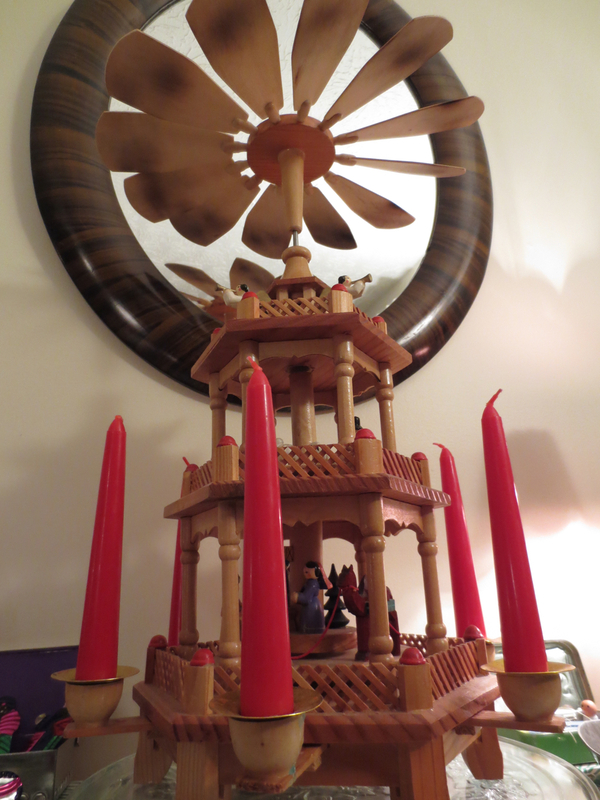 But you light the candles and the fan thing twirls and there’s a nativity inside and the shepherds spin around like CRAZY looking for Jesus and Mary, who are in the middle, about to throw up. It’s pretty boss. OMG I can’t even. This tree. Alright kids, that’s it for Part 1. Be sure to check back tomorrow for the final installment. Will there be anything child-like and creepy? Will there be any more swearing? What about more sparkly things? Discover all that and more on the momWHATareyoudoing Christmas Blogtacular Part 2!